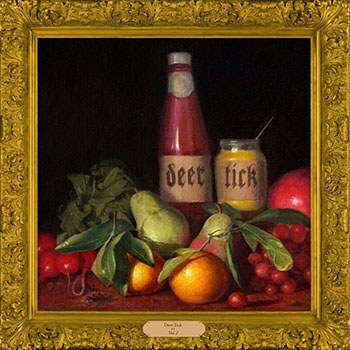 Deer Tick sidestepped the pressure of double albums by releasing two separate records on the same day, inviting but not forcing listeners to associate them. Releasing a double album is a high risk/high reward proposition. It could be so conceptually strong that it positions the band as true visionaries (see: Mellon Collie and the Infinite Sadness), or tell a story so sweeping it could never fit on one disc (see: The Wall), or cement a band's place within a particular genre (see: Speakerboxxx/The Love Below). Or, it could be a complete and utter disaster (see: Metallica & Lou Reed's atrocious Lulu). Even Bob Dylan flubbed hard on Self Portrait. Thankfully, that's a sandbox that perennially enjoyable folk-rockers Deer Tick didn't even try to play in. They sidestepped the whole "double album" moniker entirely and simply released two distinct albums on the same day, conveniently titled Deer Tick Vol. 1 and Deer Tick Vol. 2. That's not to say there isn't a relationship between the two records. Vol. 1 is the "quiet" record of mostly stripped-down acoustic numbers, while Vol. 2 is the "loud" record, full of feedback and fight. It's like the dichotomy that Counting Crows played with on Saturday Nights & Sunday Morning -- a raucous Saturday night bender followed by an introspective Sunday morning -- but flipped. And flipping that script was a smart move -- not only in terms of overall quality but because the sound of Vol. 1 is more closely aligned with Deer Tick's catalog. And it's really good -- a journey into human emotion, a series of side streets and feeder roads that, eventually, provide an onramp onto the wide freeway that is Vol. 2. Vol. 1 is the stronger of the records, a vivid look into the lives of empathetic characters, featuring surgically precise lyrics. Folk/Americana often strays toward pessimism, but usually in a direct way: tales of downtrodden wanderers, straightforward anecdotes about everyday people caught up in hard times. Deer Tick goes for something more abstract, an emotional wasteland of imagery. "Hope Is Big" is a perfect example, Ian O'Neil's voice sounding as ancient and windblown and timeless as the hills. It could have been an early Dylan tune, played in a set alongside "Blowin' in the Wind", a song that speaks to the inevitability of failure with a devastating matter-of-factness. That sense of inevitable badness carries through to "Only Love", which brings a precious sense of hope to the knowledge that everything will eventually fall apart. "It's only love, so don't be afraid / It will let you down, but not today / It's only love, only love / It won't let you down until tomorrow." Eat, drink, and be merry, it says, for tomorrow you're gonna be a sadsack. Juxtapose that with the upbeat bitterness of "Card House", whose chorus ends with "You can sail away on the finest timbers / I can run your ship aground." Start to finish, Vol. 1 is a damn fine album with lots of lyrical and emotional nooks and crannies to explore. Vol. 2 takes a whole different tack, plugging in, cranking the feedback, and truncating the compositions to near-punk lengths. It's done somewhere between the styles of the Replacements and vintage Tom Petty, mixing radio-ready hooks with intentionally messy playing. It has some ridiculously catchy tracks, chief among them "Jumpstarting" and "Tiny Fortunes". The only downside is that by making the surface area of their sound bigger on Vol. 2, they reduced its intimacy. There are fewer emotional touchpoints, fewer of those delicious nooks and crannies that make Vol. 1 a disc worth revisiting several times. Vol. 1 and Vol. 2 are technically separate releases, but one can't help consider them as a whole. And despite spanning 20 tracks, there's virtually no filler here. If pressed to find deadweight, only a couple of tracks come to mind. "Me and My Man" from Vol. 1 is a bit one-note, and "Pulse" from Vol. 2, while interesting, doesn't fit so well within that sonic universe and stretches on for long enough that you wish there'd been some lyrics -- even a handful of curated lines in the middle -- to break the monotony. Deer Tick could have done a lot with their plethora of strong songs: made painful cuts to release a regular album, or shoehorned an overarching narrative in and called it a concept album. But the simplest solution was the correct one. They just put out two good records on the same day, inviting but not forcing listeners to associate them. Vol. 1 is better, but as a whole, they're a good entry point for new Deer Tick listeners. You get some acoustic tracks with finely crafted lyrics and then a hook-heavy rock show to finish it off. If history has taught us anything, you could do far, far worse than this non-double album.